So, I think that we may have folded laundry once or twice this past year. I know. Shameful. I told Joey to take a picture of me under the giant pile of laundry I was slowly folding my way out of. He said that he was too embarrassed…so I figured that I’d go ahead and put it out here for the whole interwebs to see. Of course, if you’ve been reading my blog for any length of time, or you’ve read my hundred things about me post, this is no surprise to you. We tackled the monster today and won. And I’m going to have a big bag of stuff for Goodwill, too. Maybe it’s also time for another yard sale. While we’ve never made as much money as we made at the first one we did, it’s still a decent way to make a little dough for not too much effort. Maybe in September. I cannot WAIT to go camping. Today, we went to Wal Mart and were able to outfit the camper with some pretty nice stuff. I’ll feel a lot better Thursday afternoon when we’re all set up, but the thought of six days of camping bliss has me over the moon. I hope I’ll be able to focus during work this week. I’m already excited. Also, it’s nice to feel excited about something again. One of the things I missed most about mental stability is the ability to enjoy things *today* rather than always fretting about tomorrow or wishing that I’d taken more time to enjoy yesterday. The day after we saw The Monkees, I cried of and on all day because I knew I’d never get to have that joy again. It was like I completely ignored how insanely joyful the day/night was and focused only on what I’d no longer had. I’m now able to see it for the joy that it was and, even though I doubt they’ll tour again in five years, I got to see them twice in my life. I actually feel like putting on makeup again. I actually feel like cooking at home and taking care of myself. I actually feel like pulling out the Wii fit. I actually feel like painting my nails again. I’m starting to see the joy in the small things. In the today things again. I don’t feel as guilty that I want to take care of my skin, that I want nice makeup and cute clothes and that it’s okay to worry about those things, too, and not to get increasingly overwhelmed because there are shelter kitties without homes that I can’t help, that I can’t necessarily live the lifestyle that I want, to have the job that I want right now, to eat in a way that matches my ethics. But I do feel like I’ll be able to get there eventually. I feel like I can take the one step forward and then wait to be shown the one after that, rather than standing still, too afraid to make any move. A month or two, I would have been too overwhelmed even to look at the laundry pile in its entirety, much less than to touch it and definitely not to fold it. I wouldn’t have been able to clean the coffee table or spend ten or fifteen minutes vacuuming the living room. Tomorrow, I’m going to try to tackle the dresser. 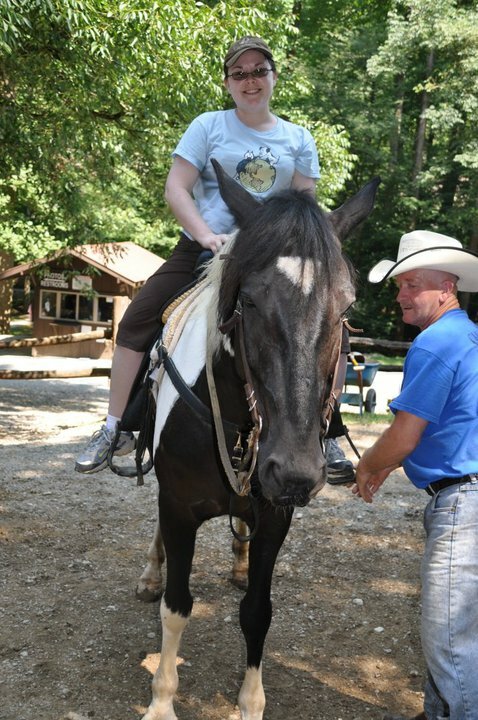 Me on the horse I rode last summer in Gatlinburg. Her name was Daisy!! Okay, folks. I’m going to hit the bed, I think. My low-battery light came on, and this post is too long anyway:-). 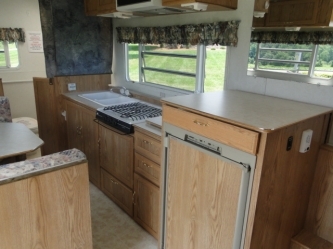 Camping sounds like fun, especially when you have a cute camper like that. I think I would be too skerred to go horseback riding. I did get a little saddle that I am going to model soon though! I was a little scared to go horseback riding too, but it was fun. The horses are probably to big for kittehs, though. 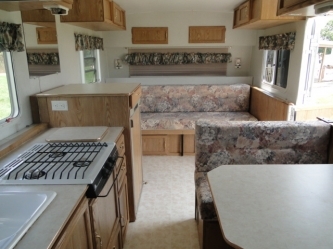 And we bought the camper that we did so that Shelli can go with us! There’s a perfect hidden spot in the bathroom for a private, very spacious litterbox:). We hope she’ll get comfortable enough in it that she can go with us for our long camping trip in November!